Dressing tables, makeup tables, vanities: no matter what they were called, the elegant furniture has been around for centuries. Whether lavish or plain, wood or crystal, swathed in silk or sleek and modern, vanities say a lot about a lady and her style. Today, vanities are reclaiming their place as a fascinating, decorative statement. As early as 4000 BCE ancient Egyptians kept eye colors and perfumes in ivory or stone jars, and make up was stored in boxes simple and elaborate, called caskets, which were displayed in the home. Polished metals, rocks or glass were used as "mirrors" for centuries until a metal backed surface was added to the glass. For more than 1,000 years, make-up was considered a mark of vanity, and frowned upon by church and state. 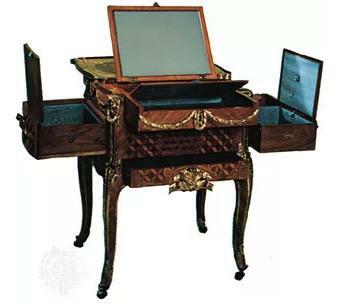 The mechanical table was used for reading, writing, or dressing. 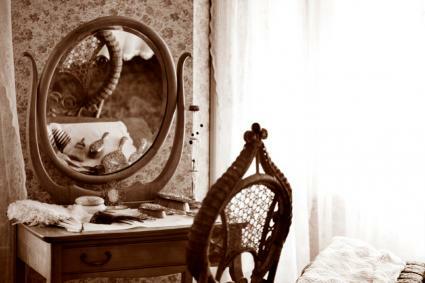 Well-to-do women entertained friends in the "boudoir" (meaning "to pout") at dressing tables (or vanities, from the Old French word for "empty"). Chairs and benches played their role as well: King Louis XV ordered an innovative chair that spun around, making it easy for the maid to assist a lady with her hair and makeup. Vanities through the years were very beautiful. An exquisite vanity was created for the Duchesse of Parma in a glass workshop owned by a woman, unusual for that time. The 18th century furniture maker continued the tradition of elaborate dressing tables, often designed as a piece of art on its own. In England the tables were made from satin, yew, tulip and other hardwoods. Furnitures styles included Queen Anne, Hepplewhite, and Sheraton, each with distinct features including cabriole legs, curved edges, and drawer pulls. 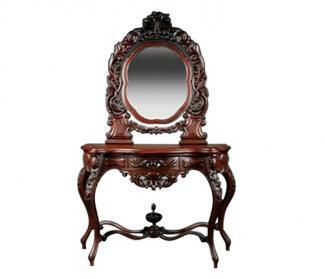 Very high prices have been paid for early American examples like a Chippendale mahogany dressing table, with its ball and claw feet, carved shell and brass handles typical of the era and style. By the 19th century, American designers like William Codman created showpieces like one covered in hammered silver. In the 20th century, the dressing table was associated with glamorous film stars, and women purchased Art Deco dressing tables that displayed the style's rounded fronts, amber and brass drawer pulls, elaborate veneered designs, and beveled mirrors. By the 21st century, The Metropolitan Museum presented a 2013 exhibit called "Vanities: The Art of the Dressing Table". You can download the show's catalog. Despite changes in life styles and design, the interest in vanities continues. During the past 75 years, furniture companies hired well-known designers to create dressing tables for the discriminating buyer. These examples are still sought after for their style, and as statement pieces for decorating. George Nelson designed for the Herman Miller Furniture Company and a large piece can cost upwards of $3,500. Simmons Furniture sought out Norman Bel Geddes to create this beauty. While that is a museum worthy example, comparable Bel Geddes designs come on the market for $1,000 - $2,000. Raymond Loewy, the "father of industrial design," thought dressing tables added to a home environment's style. His designs can command $2,000 - $4,000. Dressing tables, both vintage (under 100 years) and antique, are still popular and collectible. You can locate 18th and 19th century examples at auctions (like Sotheby's). Try Cinoa for English and Continental dressing tables, and Ruby Lane for 18th to 20th century examples, including Art Deco and Hollywood Regency. Of course, there are well-made, and less pricy dressing tables at online auctions, antiques shops, and secondhand stores. As with any collectible and antique furniture, expect to pay $100 and up based upon condition, design, and age. Dressing tables can be mistaken for small desks. If the table comes with a matching bench or low-back chair, it might be a dressing table, and not a desk. Look for ink marks in the drawers: desks have those, while dressing tables usually do not. Is the hardware original to the piece and do the pieces match each other and the style? You don't want reproduction 19th century metal on 1930s Art Deco. Is there a matching bench or chair? If not, will you be able to find a bench suitable to the table? Many dressing tables had mirrors, so see if there were mounting screws or other evidence that a mirror was removed. Check the condition of the mirror: if the glass is "smoky" looking, the silvering maybe wearing off and you might have to replace the mirror. If veneer is chipped, broken or loose, make certain you can repair the damage before you buy. Dressing tables sometimes had elaborately pleated, fringed, and ruffled skirts; while these look adorable they can be difficult to care for, so consider that when faced with yards of vintage satin or ribbon. The dressing table is still a functional and fashionable addition to private space, a focus piece that acknowledges how ideals of beauty have changed over the centuries. Whether you embrace minimalism or Hollywood exuberance, there is a dressing table waiting to add its story to yours.